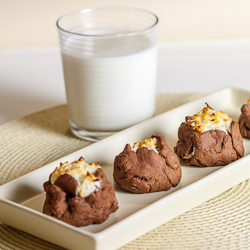 If you are a fan of cookies, you will definitely love this chocolate coconut recipe. These little things taste amazing, but what makes them really stand out is their extraordinary form. Most times, I love to try new things, and when I first saw them in a cookie recipe book, I knew I had to try them, they were just too damn adorable to pass up. They may demand a little more of your time to make, but are totally worth it. They are delicate, mouthwatering cookies, that will not fail to impress your family and guests. First step would be to add 6oz / 175ml of cream cheese in the bowl of your mixer. Next you’ll need ¾ cup of sugar. Add the sugar to the bowl with cream cheese and mix well until smooth and light. Add the egg yolk, vanilla extract and continue mixing for about a minute. And the shredded coconut and mix until the coconut is well incorporated. And that’s that for the filling. Next step, the cookie dough. In a mixer bowl, add the butter and the 1 cup of sugar. Beat well until it’s light and fluffy, add egg and continue mixing until smooth. In another bowl, mix the flour, baking soda, salt and cocoa powder for a minute. When done, pour it over the butter and egg mixture that you did earlier and mix them all together. Dough should be stiff but pliable, sort of like putty. Using a tablespoon, scoop some of the cookie dough into your hand. Flatten the dough into a circle that’s about 2in to 3in (5cm to 7.5cm) in diameter, add about a teaspoon of the coconut mixture into the middle of it and then fold the sides of the dough but do not seal it at the top. This is the part that’s a bit time consuming. Repeat this with remaining cookie dough and then put them on a greased cookie sheet. If you have coconut mixture left, do not throw it out, you can bake it along with the cookies, and they will turn out into cute little macaroons. Bake the cookies at 375° F / 190° C for about 18 to 20 minutes and enjoy. You are going to love them, guaranteed. Beat the cream cheese with the ¾ cup of sugar until light and fluffy. Add the egg yolk, and vanilla extract and continue mixing for another minute. Add the shredded coconut and continue beating until everything is well incorporated. In a medium size bowl, mix together the flour, cocoa powder, salt and baking soda. In the bowl of a mixer add the butter and sugar and beat together until light and fluffy, add the egg and beat until smooth. Add the flour mixture to the butter mixture and mix until the mixture is stiff but still pliable. Using a tablespoon, scoop some of the cookie dough into your hand. Flatten the dough into a circle that’s about 2in to 3in (5cm to 7.5cm) in diameter, add about a teaspoon of the coconut mixture into the middle of it and then fold the sides of the dough but do not seal it at the top. Repeat this with remaining cookie dough. They look so delicious!I got to give the recipe a try since I’m a sucker for coconut! My cookies came out flat when baked. All the time used to fold up sides was for naught. Any ideas why the cookies spread and flattened? Honestly, I have no idea. The dough should be like putty almost. Make sure you use butter at room temperature, not melted. Flour quantity might be an issue also, but most of the time is because of butter.